A Life-Size Replica Of The Titanic Is Under Construction In China's Countryside : Parallels Construction began in 2014. Once finished, the replica will be the centerpiece of a theme park that the developer hopes will attract millions of tourists from China and beyond. 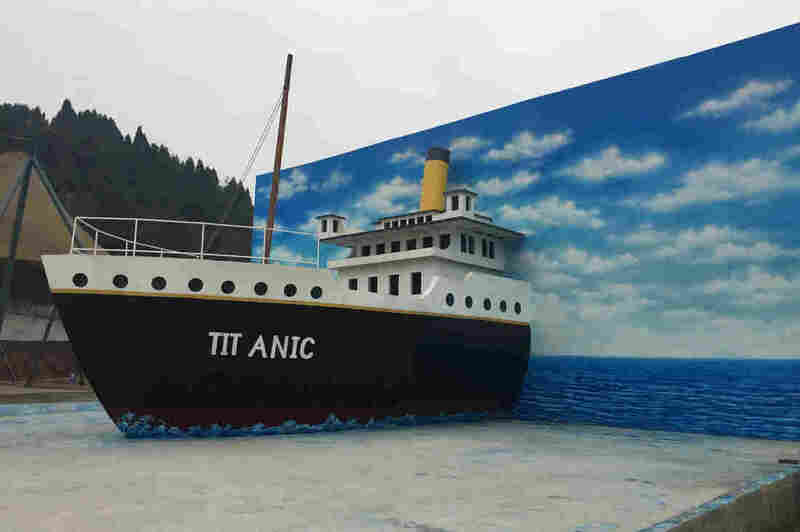 A 30-foot by 30-foot mock-up of the Titanic replica now under construction stands near the construction site in China's Sichuan Province. Why is this being built in the remote countryside, 1,000 miles from the sea? Why is this being built? The infomercial the developer screens for visitors at the site in the town of Daying, Sichuan Province, leaves these questions unanswered. The video begins with a computer-generated image of the Titanic rising from its resting place in the North Atlantic, and climaxes with non-Chinese from around the world awestruck by the project. "The incredible Titanic?" wonders a bewildered American, who then gushes: "The Chinese are amazing!" 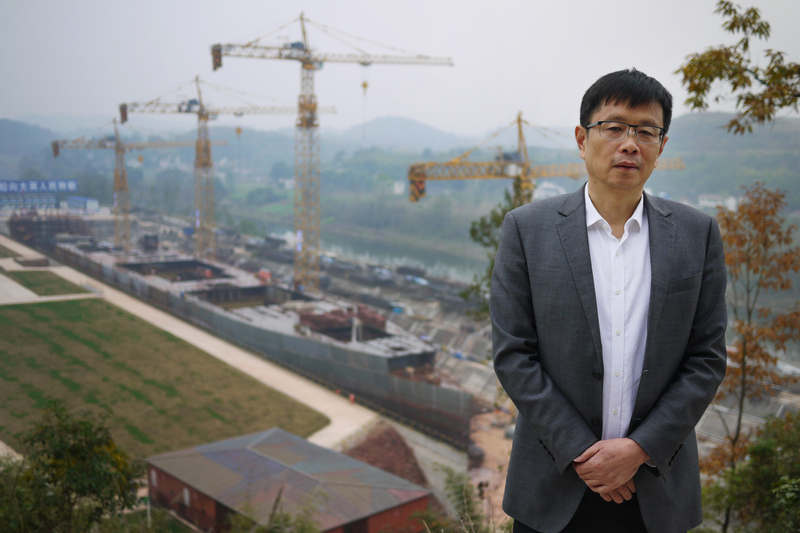 Developer Su Shaojun, president of Seven Stars Investment Group, was inspired to build a replica of the Titanic after watching the blockbuster film 20 years ago. He is also building a theme park around the ship which he claims will feature the "world's largest indoor beach." The ship's delivery date, according to the video: Aug. 30, 2017. "The unsinkable Titanic to be delivered!" the narrator promises. But work on the replica — 1,000 feet long by 92 feet wide, requiring 23,000 tons of steel — is far from finished. "I didn't expect the ship would be this big," admits Su Shaojun, the developer overseeing the project. "The movie didn't mention how big it was." Su, a fan of James Cameron's 1997 Titanic film, is president of Seven Star Energy Investment Group in Lishui, Zhejiang Province, in southeastern China. Building an exact replica of the ship in Sichuan's countryside was his idea. "I wanted to build a resort," he explains. "But I didn't want to copy others and make just another theme park. I wanted to build one that has cultural depth to it." Su watched Titanic 20 years ago, when he was a young local official in Lishui. The movie had taken China by storm at a time when the country's economy was emerging from dormancy and opportunities were everywhere. The film moved Su so much that when he became a developer 15 years later, he proposed building a resort and theme park featuring a replica. 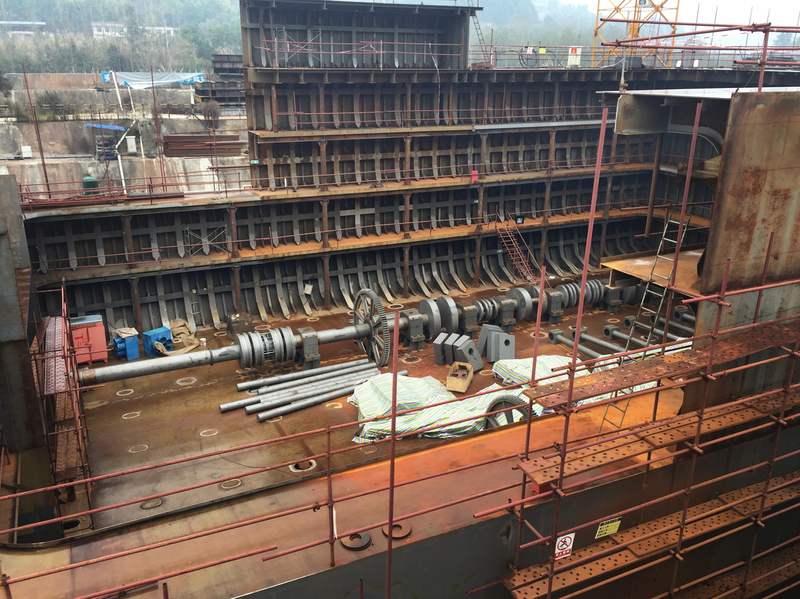 Construction is years behind schedule, but builders have completed the hull of the ship. "I thought rebuilding the Titanic would be meaningful," says Su. "It was very touching to see people give others the chance to live" — his favorite part of the film. He was also inspired to help establish the Titanic Foundation, whose goal is to help ocean disaster relief efforts worldwide. For the ship replica and theme park, called Romandisea, Su secured a loan of nearly $200 million from Zheshang commercial bank and worked out a property deal with the local government of Daying. Construction began in 2014. "Why am I so confident of its success?" Su asks, adjusting his glasses as he watches construction workers on the hull of the ship. "First, people from all over know the Titanic. Second, Daying is in between two cities with 20 million people each, Chengdu and Chongqing. The person who designed China's Disneyland came here and said we'd have more visitors than them." Peking University economist Christopher Balding is not so sure. He's seen many other small Chinese cities champion big projects like the Titanic. Many of them sink, he says. "There's a lot of pressure in government to deliver results," warns Balding. "One of the easiest ways to do that is to go out, build something really big and say, 'Look at what we've done for you.' The further we go down this road and especially the more debt-constrained China becomes, that's not a winning formula." Daying government officials declined interview requests from NPR. At the Titanic, developer Su doesn't seem worried. He's waiting for another steel shipment, he says, before crews install a replica of the engine that powered the original Titanic – an engine that will rarely be used when the replica comes to rest in a reservoir created by the damming of a river. Su's company originally promised a "hitting the iceberg experience," where visitors could experience what it's like to be on a sinking ship. But it scrapped the idea after criticism from descendants of those who survived the 1912 Titanic tragedy, in which 1,500 people died. "We might still do that," Su says, "but we won't call it 'hitting the iceberg.' We just want to show that people should let women and children go first when facing a disaster." But before contemplating the site's future attractions, work on the actual ship will need to conclude. As things stand, Su's Titanic is years behind schedule. A dam has been built to flood a valley for the resort and the ship, but the hotel complex — being built along the shore of the future reservoir and including what the developer bills as the "world's largest indoor beach" — isn't close to being finished. Crews have built the replica's 1,000-foot hull, but 2/3 of the ship remains unfinished. And steel is suddenly twice as expensive as it was last year, due to a spike in commodity prices. Workers have either quit or have yet to show up – dormitories are largely empty and cranes dotting the site are frozen in time. "People have lost confidence in it," says Zhou, a farmer who only gives his surname for fear of retribution from local authorities. "Only a few people are working on the ship. They don't have money to pay their salaries." Zhou, who farms rapeseed fields, has watched the Titanic falter for years from across a river in his tiny village of Jinwan. If the project is ever finished, the developer and the city of Dayang will flood the village of 1,000 people, which lies below the water line of the future reservoir. "We haven't heard when they'll demolish our village," says Zhou. "I'm concerned. But as long as they give us a reasonable amount of money for our land, I'll be happy." A night at the resort, he says, will cost twice his current monthly earnings of $250. Across the river, Su stands confident in the face of a question about whether re-creating a ship that ended up sinking to the bottom of the ocean is a good idea. "We Chinese can turn a bad thing into a good thing," he insists. "We want to let people learn from history." That dream is likely to be realized whether Su finishes building the Titanic or not.